New and improved casting, ideal for foil or polypropylene bags. The MEC line of Impulse Foot Sealers, with their new and improved casting, ideal for foil or polypropylene bags. 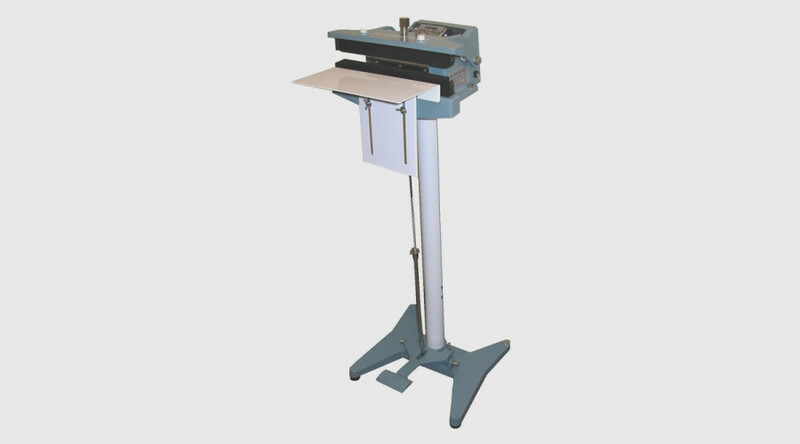 By having a foot control, the hands are free to feed the machine.Each machine comes complete with pedestal stand, adjustable work table and foot pedal. Foot operated Constant heat sealer, designed to deliver a 15mm embossed seal from top and bottom sealing jaws. Ideal for use with PP, BOPP, Foil and laminated bags. Examples of use: Coffee bags, spice packets, seed packets, washing powder etc. A full range of elements and timers etc are available from our warehouse. These special foot sealers are excellent for sealing polycello films, humidity proof cellophane film, polyethylene film, aluminium foil coated bags and gusset bags.